>DECEMBER! AHHHHH! I don’t know why I let this happen. Every darn year I’m nose deep in holiday anxiety and stress. It’s just ridiculous. Last year I thought I’d focused more on what was important. Baked and did crafts with my girl. Went sledding with my family and drove around to see Cmas lights. I spent hours downloading and creating the perfect Christmas playlist for my Ipod. This year, granted I had a baby 4 mo. ago, just snuck up on me like an evil elf ninja. NEWS-FLASH , Christmas is the same time EVERY year. It’s not like I don’t know it’s coming. And still. 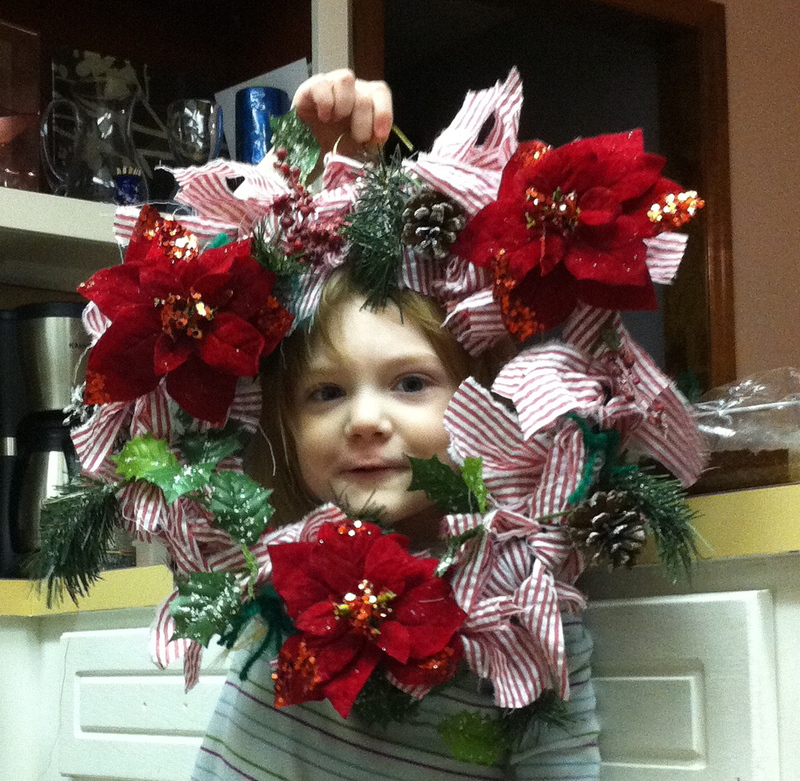 . .
I’ve been telling AJ that we’d make a wreath for the door for probably 2 mo. straight. I have been crafting like crazy but mostly to fill baby hat orders (I make crochet hats) and I’ve been working on a present for my husband. I will definitely be doing a post on that project in the near future. I’ve got to let you all in on the disaster that t-shirt quilting can be. Anyway I’ve totally lost sight of everything that’s important during this season. So yesterday I decided I was taking Christmas back! We made a gingerbread house and some fudge. mmmm fudge. I reminded AJ about Jesus’s Birthday and how much fun it is to celebrate. We talked about Santa and how much we’re anticipating Christmas morning. She wants to leave a cake for him. I told her that his tummy might be too full for a cake and how we should probably just stick to cookies. 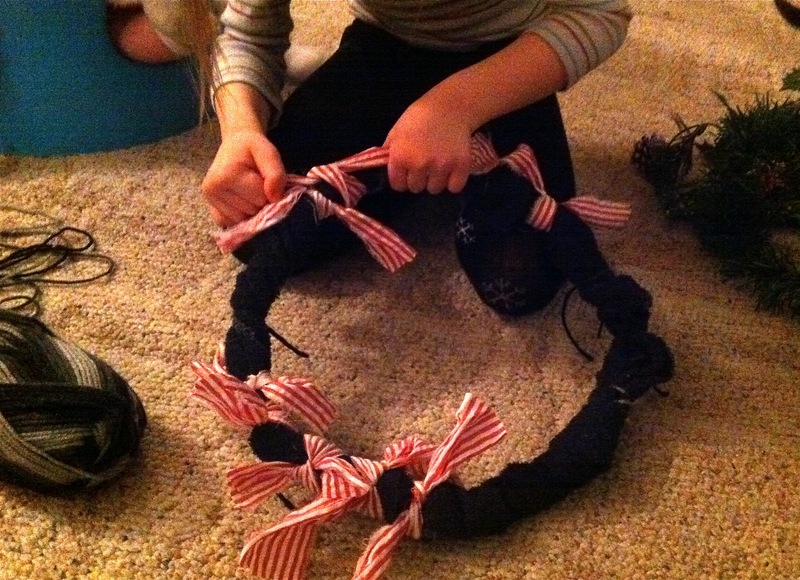 Ok so we made this wreath the same way as the Fall wreath that we made in Oct. It takes about 1/2hr. If you spend any more time on it then that you’re over-trying. The sloppier the better it turns out, honest. Start with a hanger and bend into a circle leaving the hangy part at the top. I used an old hand-towel and ripped it into strips. 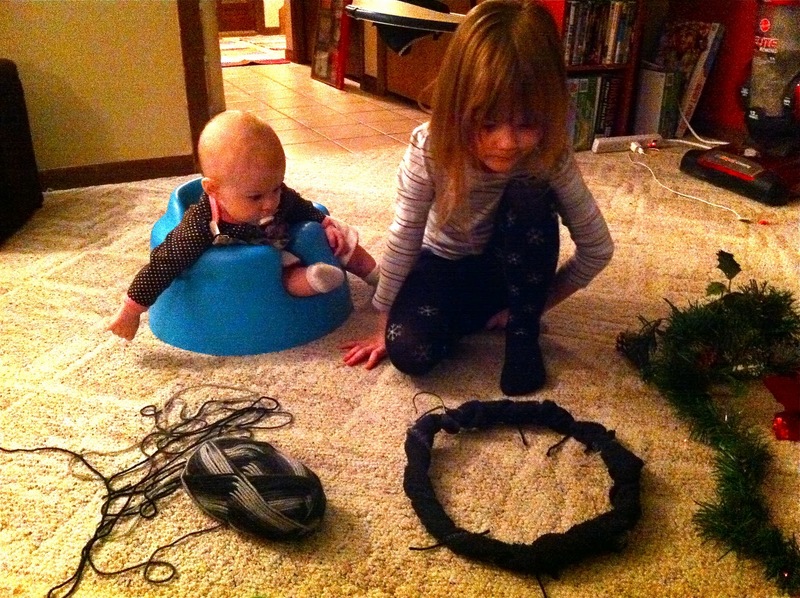 Wrap them onto the hanger and tie in place with thread or yarn or bread/garbage ties. I ripped fabric into strips and let AJ tie them onto the towel covered hanger. 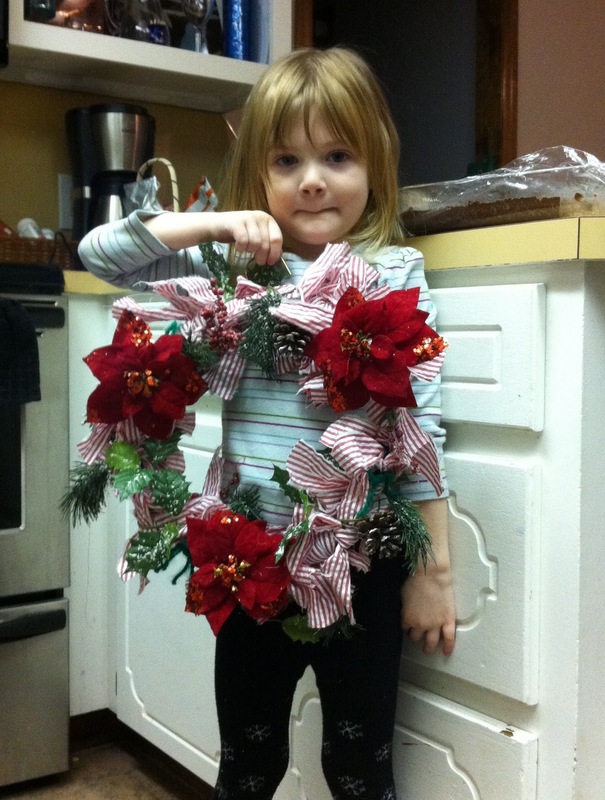 She was twice as fast as last time we made a wreath. She’s getting great at tying. Next stop: shoes! You can use anything Christmacy to decorate. I used trimmings I had in my decorations box and just stuck them into the ties. 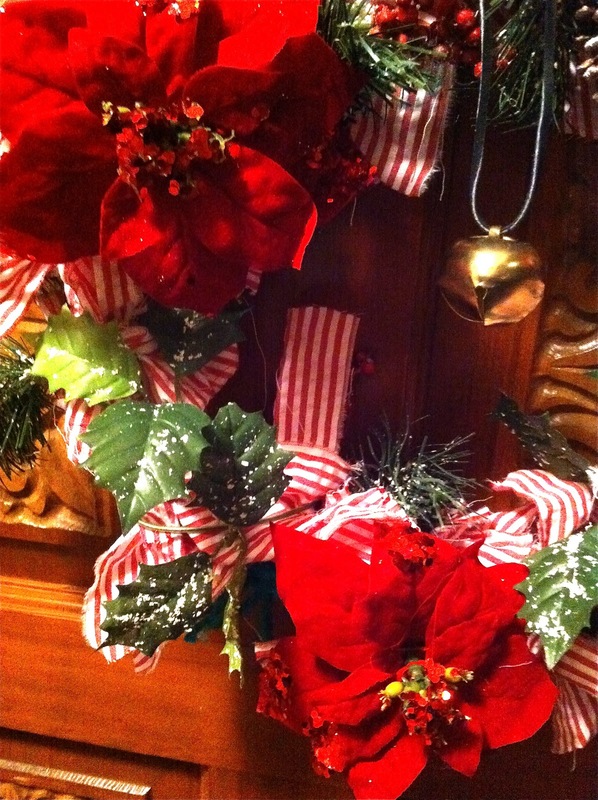 The nice thing about these wreaths is you can change them later. The flowers just clipped on. 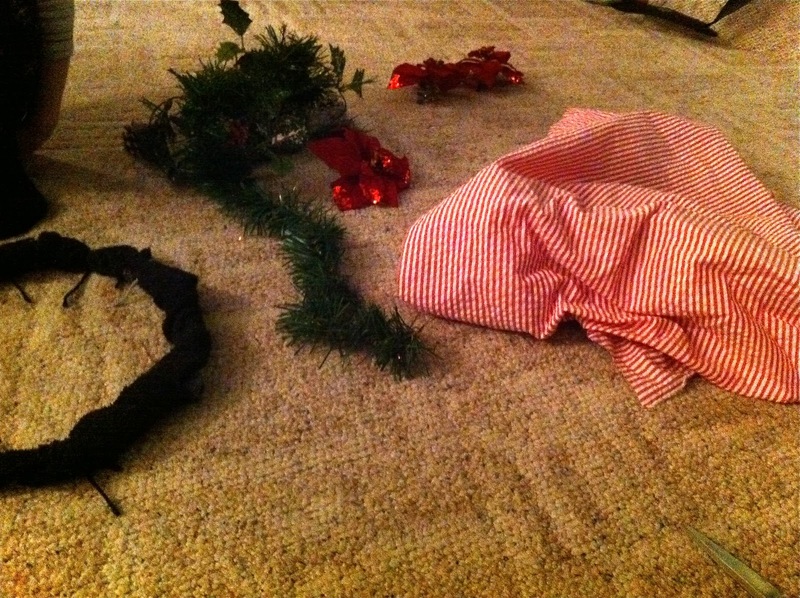 I found a strip of garland and wrapped it around the wreath and tied it at the bottom. You could use pine cones, evergreen garland, popcorn and cranberry garland (this is fun to make and also eat- this year we made it for our tree and used craisins instead!) You could even use Cmas bows/ribbon. The final touch was the sleigh bell we hung around the hanger. 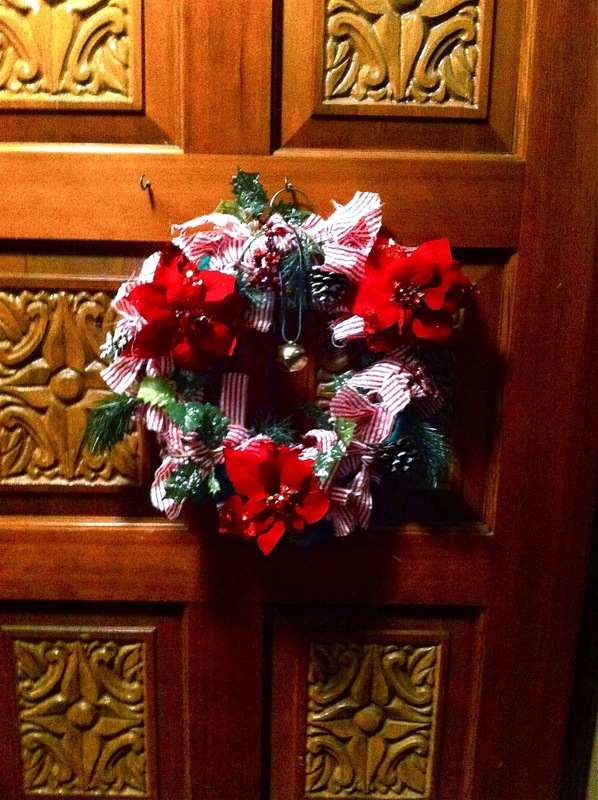 Now every time the door opens it sounds like Christmas. >Ali made one of these and absolutely LOVED every minute of it. Your ideas are SUPER! >Abbs so awesome!!! Geeze woman, I honestly don't know how you do it. I mean, now I know HOW you do it, but your creative mind is astounding to me 🙂 Love you TONS.